hi Mine is 209 a the hubs ( not rolling road) at TDi power, making about 338 and it weighs 760kgs in race prep with a few ltrs of fuel. Lotus race here say its normal ! The car is still very quick, my 340r is 220 bhp with 630 kgs but the 211 still pulls away out of bends ( not into them under brakihng though :-) ) oops forgot to say, Lotus sport have a 280 upgrade ECU ready that does then give us the real power. Not ready to hand out as yet. twill be 3 cars I reckon, so we can use the wider bit of the A12 and let everyone wait like very bad children, I have to admit we used to do this on country lanes when much younger, I have grown up now honest. 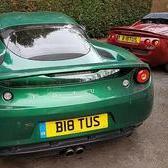 sounds great.. my mobi is 07850 766786 , sadly I am away for two weeks in the USA on Business then end of the month up to Outlen park for another Lotus on Track race. must go faster on long bends is the thing I need to tell myself. Reverie made my wing to exact spec as Lotus one other than Carbon side plates inplace of alloy. Cheers, I will get my head around the info, I just heard from FSR ( Full Speed Racing) Mark Speller that they have now done a LOT of work to Martin Donnelly's Silver 211 for Oulten park so this will also be interesting. Lotus basically have the 270bhp upgrade ready and will announce this shortly. For myself I want to leave my car well alone and wait to see what the LOTRDC series deceides in the way of regs so I dont waste money. Lotus Sport were at spa and even tkaing the grill mesh out of the vents for the supercharger intakes makes a differeance but more can be had if you open the slot in the wing up as much as you can. I had noted this had been done to the white 211 run by FSR as well, not that I think it can make much differance. The cars just looked great with the carbon lid and aero screen, loe to have this but then the car is non standard, so I will await the rules. Easy car to drive round the traack, I still dont have what it takes for fast bends yet, need more track time. cheers, I am here the rest of the week love to, name a time and I will see if it all works out. Thanks, it was a great weekend. Speller who looks after Donnellys car has to clean the holes out every single race without fail. But I was particularly hard on the brakes and not being used to ABS on a race car I am sure I have been over using them.. I am away for a couple of weeks will let you know as soon as I am back. Quick note ref race at Brands BOTH Gav and I have now put AP 295 discs on, the standard ones had died after an hour or track day use, even with a new set of Pagid 14s they brakes had gone. The standard ones need the holes cleaning every 30 minutes to keep them working. I have put softer RS42 pads on with the 295s for now to see how they go. Other than me getting lazy in race 2 and braking early becuase of laziness and a different feeling to the brakes and concern over the brakes, the car was fantistic. Drove there and drove home, sadly the other two cars cannot be said the same for at A1. I will take out the rear inner mudguards, as these stop all the air from the front top vents getting to the lovely vents at the rear and cooling both brakes and tyres ( which suffer a lot). This will also aid less drag and top speed. It looks like it was designed like this and the plastic inner wings added as an after thought. Of course some armourfend will go inside the wings other wise the stones will go through the lovely organge bobcat colour. All up great car, bad driver..
hope to be there for 4 ish, trouble getting both cars there at the moment thats all and picking up the rear spoiler from Reverie, the car from Speller havign been set up and fire ext fitted etc, damn I dont have the time this running around in fact but hey hopefully this is the last running about now as both cars are race ready at last.